Citizen Cope’s anthemic brand of indie folk makes for a moving live experience. Sounding personal yet electric, he managed to connect with every individual in the audience while getting them to sway collectively. Either unaccompanied or with his full band, his music is starkly poignant and richly textured. Alice Smith started off the evening with a style very reminiscent of 80’s pop R&B. Her band features a jazz vocalist’s ensemble with drums, keys, and bass laying down funky pop grooves that recall Billie Joel. Yet, she sings with confident and refined soul in every note, recalling singers as diverse as Macy Gray, Gloria Gaynor, and Janis Joplin. She has a very refreshing approach to her songs, waiting until the end to really hit her high notes—instead of caterwauling through the entire song, as some soul-soothsayers might. The end result is that every song is fulfilling, funky, and purposeful. Truly a singer to keep an eye out for in the years to come. 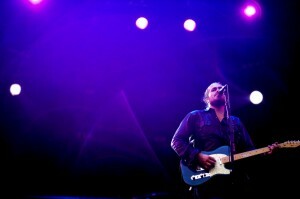 Citizen Cope then took the stage with his full band and an acoustic guitar. Until I saw him, I didn’t realize what a profound textural effect his guitar plays in every song. Between his uncommon chord transitions and his affinity for dissonance, he demonstrates a subtle mastery of his instrument that perfectly complements his singing and performance style. With Citizen Cope, the beauty of his songs provide the rapport with the audience as he stands bolt upright for the majority of the performance. He’s not pandering or baiting; he’s connecting. This style might make for boring performances with lesser artists, but appears genuine in the case of Citizen Cope. Indeed, I had to assimilate to his approach before I got into the groove of the evening. Fortunately, this only took a couple of songs. By the time he got into “All Dressed Up,” I was tapping my foot and dancing to his coolly funky sound. He kept his head-bobbing soul vibe going with “DFW” and “Something To Believe In,” before drawing the audience in even further with “Bullet and a Target.” The moving, gritty lyrics feel even more honest when he’s tossing them off before your eyes. Here, too, the audience got involved, recreating the handclaps of the original recording without even being prompted by the band. By the time he reached the looping pop of “Let the Drummer Kick,” the audience was worked into a hooting and hollering frenzy. Blending rap, reggae, and blues so seamlessly on a recording is already impressive—recapturing that same feeling during a live show is uncanny. Citizen Cope never seems to fail at delivering flawless, touching recreations of his already beautiful songs. However, the highlight of the evening was easily when Alice Smith joined Citizen Cope on stage. For “Healing Hands,” her voice melded perfectly with his, singing in unison during the verses and soaring in harmony during the choruses. Her voice adds a brilliant dimension to songs that already felt perfect—as if her voice were there with his on the original recordings. When you listen to the album again, you might even hear where her lines would complement his. On “107°,” their duet creates the additional tension of placing his prodigal lover on stage to sing his pleas back to him. The effect is heartbreaking and staggering. For the conclusion, he tore into a version of “Son’s Gonna Rise” so spiritually oriented that it had a hymnal feel to it. That’s not something you often say about a funky song, but Citizen Cope is admirably unconventional. By the end of the song, rainbow lights shoot out over the crowd, making the music truly transcendent. If you ever questioned how popular music could be spiritually satisfying, you should see Citizen Cope perform. He’ll touch you, move you, and uplift you.